The point of a bank isn’t money – it’s service. 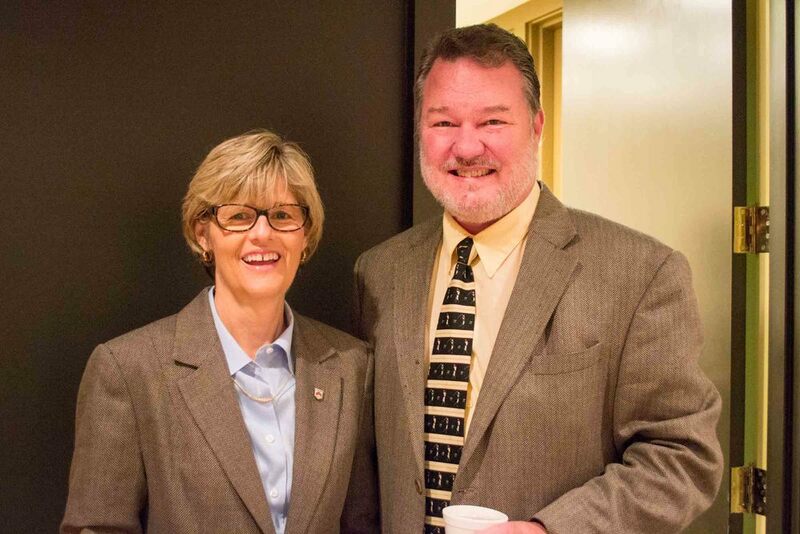 Paragon’s Senior Vice-President and Senior Consumer Banking Officer, Carol McConkey, with Tim Bolding, Executive Director of United Housing, Inc.
Paragon National Bank netted a tremendous response from its employees during its annual United Way of the Mid-South campaign. During the 2013 fundraising campaign, more than 90% of the bank’s team members made a financial contribution to support the United Way’s network of nonprofit organizations in the Mid-South. “At Paragon, we are continually focused on ways we can lend support in our community and I’m very proud that are employees share that same passion,” said Robert Shaw, CEO of Paragon. In late October, Paragon hosted an all-employee breakfast to kick-off its 2013 United Way campaign. This year, the breakfast featured guest speaker Tim Bolding, Executive Director of United Housing Inc., a nonprofit affordable housing agency that targets its services to families who are underserved by the traditional homeownership industry. Bolding shared the organization’s mission and how United Way fundraising efforts support nonprofit organizations like his. Since 2005, Paragon has been a lending partner with United Housing, which is also an affiliate organization of the United Way of the Mid-South. Additionally, the bank’s Senior Vice President and Senior Consumer Banking Officer, Carol McConkey, has been an active volunteer with United Housing for 18 years and also serves on the organization’s board. Following the kick-off event, employees were offered incentives to participate during the two-week campaign through company drawings and giveaways. As a member of United Way Worldwide, United Way of the Mid-South has served the people of the community since 1923 through impacting people’s lives by mobilizing community resources to address critical health and human service needs. For more information, please visit uwmidsouth.org. United Housing, Inc. is a 501(c)(3) nonprofit affordable housing agency that serves the City of Memphis, Shelby County and West Tennessee. Founded in 1994, United Housing has served Memphis and Shelby County by helping more than 2,500 families own a home. In 2000, United Housing joined the NeighborWorks America Network and is now linked to more than 230 local nonprofits nationwide that are working to revitalize America’s declining neighborhoods. For more information, please visit www.uhinc.org.